Independent Bookstore Day is April 27, but the fun starts on April 1! Click on the above image to download your Bookstore Passport Game For Booklovers and join the quest throughout April. Books Inc. in Laurel Village at 10:00 AM - The Young Performers Theatre presents scenes from their new production of Madeline at the Circus. Books Inc. in Laurel Village at 2:30 PM - Tap into your Ada Twist, Scientist and join us in the "lab" for some science project fun! Books Inc. in Laurel Village at 3:30 PM - Join Mary Burk for a discussion of her comprehensive guidebook, Stairway Walks in San Francisco: The Joy of Urban Exploring. Books Inc. in Palo Alto from 11:00 AM to 2:00 PM - Join Children's Book Specialists Drew & Lorilee for fun storytime readings taking place throughout mid-morning to the early afternoon. Plus, throughout the day - Stop by the Out of the Box "Maker" Acitivity Station to get crafty, help put together jigsaw puzzles, play with your words at the Magnetic Poetry Station, and make your own bookmark! Spend $100 or more and receive an Advanced Reader Copy of an adult title that hasn't yet hit the shelves. Refreshements will be served + biscuits for your dog friends! Books Inc. in Palo Alto from 12:30 to 2:00 PM - Margaret Dumas stops by for a meet-and-greet booksigning of the first book in her humorous mystery series, Murder at the Palace: Movie Palace Mystery #1. 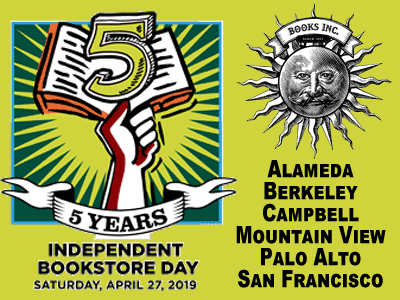 Books Inc. in Palo Alto from 1:30 to 3:00 PM - Acclaimed historian Leslie Berlin stops by for a meet-and-greet booksigning of Troublemakers: Silicon Valley's Coming of Age. Books Inc. in Palo Alto from 4:30 to 6:00 PM - Newberry Honor Winner Gennifer Choldenko stops by for a meet-and-greet book signing of her fantastic middle grade books One-Third Nerd and her Tales from Alcatraz series + her delightful picture book Dad and the Dinosaur. Books Inc. in Mountain View from 11:00 AM to Noon - Author and fellow bookseller Kathy Ellen Davis joins us for a storytime reading of her delightful debut picture book, Ta-Da! + a variety of some of her favorite picture books. (Ages 4+)Plus, throughout the day - A coloring & activity table and in-store scavenger hunt for kids! Books Inc. in Campbell from 1:00 to 2:00 PM - Local blogger Lisa Prince Newman joins us for a meet-and-greet booksigning of her stunning debut cookbook, For the Love of Apricots: Recipes & Memories of the Santa Clara Valley. Books Inc. in Campbell from 4:00 to 5:00 PM - Critically-acclaimed author Mike Chen stops by for a meet-and-greet booksigning of his Publisher's Weekly *Starred Review debut novel, Here and Now and Then. But wait, there's more! Loved that book? Leave a review to let fellow book lovers know why they need to read it; strike a pose in our cushy Literary Selfie Station; and don't forget to enter the "Guess How Many Books Are in the Store" contest for a chance to win a spiffy Books Inc. Tote Bag + a Gift Card for a neighboring business in The Pruneyard Shopping Center. Refreshements will be served throughout the day. Exclusive Items! Created for Independent Bookstore Day 2019, these items will be available for purchase in limited quantities at Books Inc. locations on April 27th. Items can only be purchased in-store and can't be found anywhere other than indie bookstores. From top left: Neil Gaiman Literary Luminary Pin; Louisa May Alcott Literary Tea Towel; Wings of Fire Exclusive Winglets Short Story; Signed Edition Ada Twist and the Perilous Pants with free iron-on Ada Patch; Exclusive Elmo's New Puppy Little Golden Book; Margaret Atwood Literary Luminary Pin; Signed Edition Maneaters Vol. #1 by Chelsea Cain Lia Miternique & Kate Niemczyk; Signed Edition of Adjustment Day by Chuck Palahniuk; Run with the Hunted vinyl recorded by Charles Bukowski; Fight Evil, Read Books Enamel Pin; Signed Edition of Women Talking by Miriam Toews; On the Come Up Journal with bound-in letter from author Angie Thomas; Toni Morrison Literary Luminary Pin; Chimamanda Ngozi Adichie "We Should All Be Feminists" Canvas Pouch; Signed Edition of Why Don't You Write My Eulogy So I Can Correct It? by Roz Chast; Vinyl Stickers + Signed Edition of The Girl Who Drank the Moon by Kelly Barnhill; What to Eat with What You Read Collection; James Baldwin Literary Luminary Pin. This Independent Bookstore Day, we want to thank you for supporting Books Inc. with a gift of free audiobooks! Mad e possible through our audiobook partner, Libro.fm, there is no cost or commitment required. Simply create your free account before April 27th and you’ll receive free audiobooks for being a Books Inc. customer. Visit any Books Inc. location on Independent Bookstore Day for the opportunity to download four complimentary digital audiobooks from Libro.fm! Titles include The Black House by Peter May, Mothers' Group by Liane Moriarty, Missing Pieces: Hello Neighbor #1 by Carly Anne West, and Make Your Bed: Little Things That Can Change Your Life . . . and Maybe the World by Admiral William H. McRaven.